Function Generator (sine, sawtooth, step, square & triangular waveform) , Arbitrary Waveform Generator, RF and Microwave Signal Generator. We Only Deal in Tamil Nadu. 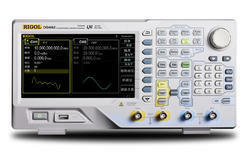 We are offering a wide range of Arbitrary waveform output. Arbitrary waveform generator designed for industrial, scientific research and educational applications. The series comes in bandwidths of 80MHz (AFG-3081) and 50MHz (AFG-3051) with built-in multiple standard waveforms to meet users' diversified needs. To meet the various requirements of the customers, we are involved in offering a wide assortment of Arbitrary Waveform Generator. - Sine, Square, Pulse , Triangle , Ramp , Noise , Exp rise & fall Pulse etc. and Arbitrary waveform Generation capability. - 20 MHz. To 80 MHz. Onwards. - Modulation , Sweep , Burst features.